Some brides may choose to go classic or subtle on the color for their wedding day. Others might choose to go bold and make a statement with their wedding dress. The dress then becomes the theme for the entire wedding. Choose a burgundy red for your fall wedding and have all of the centerpieces accent your gown. Or go classic for the ceremony and bold for the reception. Whatever you choose, here are some gowns for the bold bride. This David Tutera for Mon Cheri gown is anything but ordinary. The Orabelle satin gown, covered with floral printed organza, is perfect for that spring wedding. The soft colors aren’t too bold and would look gorgeous in an outdoor ceremony. It’s also available in black and white. The Indigo tulle and satin ball gown features an indigo organza layer that makes the dress quite the statement. It’s perfect for that bride that still wants her Cinderella moment, but doesn’t want to be too traditional. And, after all, Cinderella’s gown was blue, right? If the blue is too bold, the dress is also available in ivory or tea rose. Gold, metallic lace takes this dress from classic to daring. While the color isn’t too bold, the gold lace takes this dress to the next level. If you prefer it to be subtler, this Mon Cheri Gilda gown is also available in white and silver lace. Jasmine fit and flare can be daring or understated, depending on the color of the lace you choose. The black lace along the side of the gown is sure to set you apart. 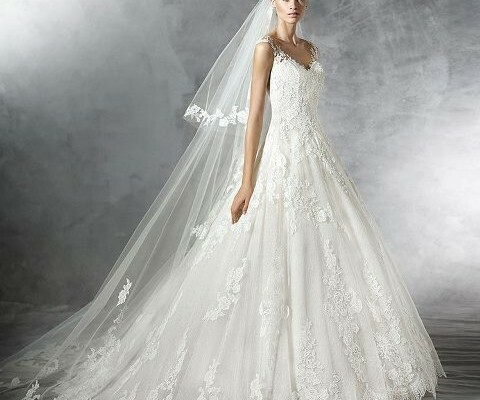 If you prefer white or ivory lace, that’s also an option. Not every bride wants to go bold, but for those that do, there are so many choices. From florals to dark colors or simple lace appliques, there is a lot to choose from.